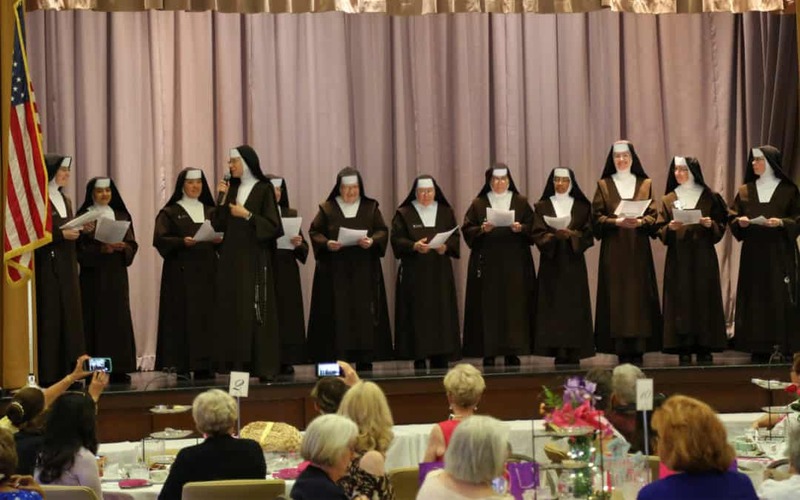 On a beautiful Spring Saturday in May , 160 lovely guests came to share in an afternoon of Joyful celebration of the gift of friendship while enjoying delicious treats and tea. Elegantly decorated tables with a touch of creative charm were adorned with exquisite tea sets, delightful flowers and, best of all, with laughter, fun and warmth. “Blossoms of Friendship” honoring Our Lady of Mount Carmel was this year’s theme and was quite appropriate for this First Saturday in which we honor the Blessed Virgin Mary. The love and prayers of Our Lady could be felt as many tables featured a delicate statue or image of Mary to honor her as our Mother, Queen and the best example of true Christian friendship and communion. We are so grateful to all who attended and helped to make this day such a success! We especially thank our 2018 Sereni-Tea Committee who dedicated many hours of hard work and sacrifice to make the day so beautiful. May God reward you and we hope to see all of you again next year!